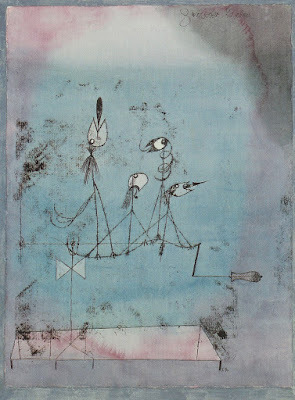 Twittering Machine, Paul Klee, 1922. In 1938, following the premier of The Lady Vanishes, Alfred Hitchcock stopped in at an art exhibition in London to admire a certain painting. He paced back and forth in front of it, then walked away for a moment—only to circle back again for another look. He wondered if he could afford its £600 price tag (that’d be ≈$35,000 today, converted and adjusted). True, the film was confirmed to be a hit, but still.... Eventually, he went for his checkbook—and Paul Klee’s Mask and Scythe became one of the founding pieces of Hitchcock’s museum-quality collection of modern art. It’s easy to see why Hitch wanted that painting. Of all the artists whom he admired (and there were many), Klee—a modernist master and instructor at the Bauhaus—was the one he identified with the most. The two were kindred spirits. They both gleefully mixed lightness and darkness, comedy and the macabre, suspense and humor in new, modern ways. They offered easy entertainment, yet upon closer examination their work yields up much more serious matters. 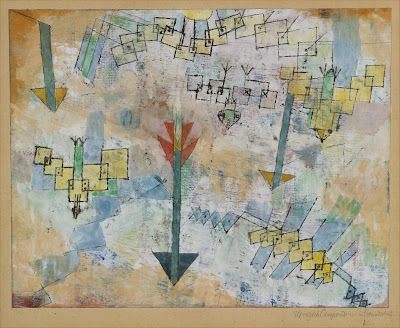 In fact, the similarities are so abundant that sometimes it seems as if their work ‘finishes the other’s sentences.’ Klee wrote in his diary in 1906: “To emphasize only the beautiful seems to me to be like a mathematical system that only concerns itself with positive numbers.” Hitch just as easily could have said it. Over the years, Hitchcock purchased three Klees: Mask and Scythe, Odyssey 1924 and Strange Hunt. Over the next few days I’m going to post my thoughts about the relationship between Hitchcock’s films and Klee’s paintings. Why? Because Hitch often told interviewers, friends and anyone else who would listen that Klee was his favorite artist. He also claimed that a great deal of his creative inspiration came from fine artists. 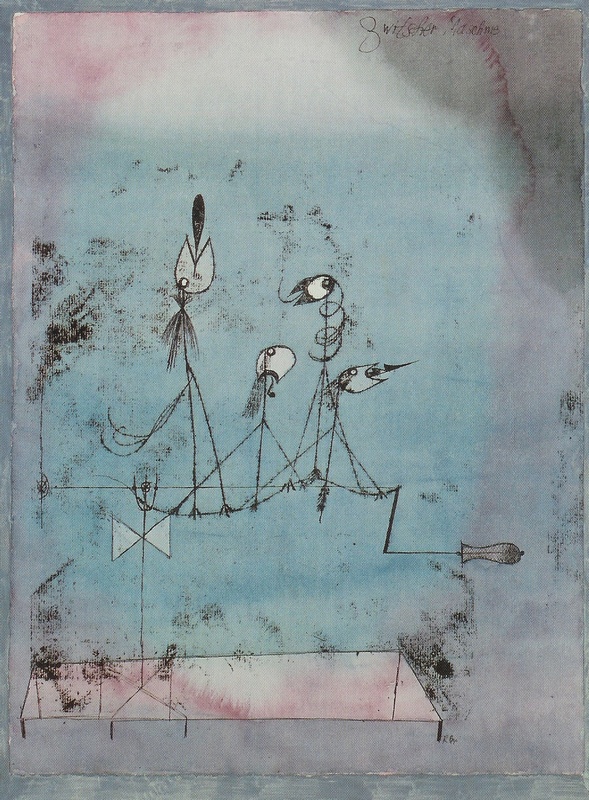 Plus, Klee’s work—or, at least, Klee-like sensibilities—can be found all over Hitchcock’s films. We know that Klee influenced Hitch, but the record doesn’t exactly tell us how. While Hitch never specifically stated that this or that shot or scene bears Klee’s stamp, I believe it’s a good exercise to try to break that down. What you’re going to see over the next few days are my geek-educated guesses—mixed with cold, hard facts and some pretty good research—as to how, exactly, Klee’s influence found its way into Hitch’s screen. Come back tomorrow!